Nordictrack C700 Vs C800 – A Thorough Analysis! The NordicTrack C700 and Nordictrack C800 are two entry-level treadmills that can give you the best value for your money. But which is the better choice between the Nordictrack C700 vs C800? Both models share some similarities in their design, assembly, and features. These NordicTrack treadmills are powered by a 2.75 HP motor although the C800 has more workout programs than its cousin. The latter also has a longer tread belt making it more suited for taller individuals. Those are some of the differences between these two NordicTrack treadmills. Continue reading to find out which model is better suited for you. The NordicTrack C700 isn’t built for experienced gym buffs. It’s designed more for the casual user; one who prefers to walk leisurely instead of running at a breakneck pace. The 10% incline of the treadmill makes it ideal for walkers. The NordicTrack C800 is slightly better than the C700 with its 12% incline. Thus joggers and runners will find working out on this treadmill a practical and convenient alternative to running outdoors. The Nordicktrack C700 has a fairly standard 20 inch x 55 inch tread belt. The width makes it ideal for walkers while the 55 inch length gives users enough room for running and walking. However, it may not have enough length for people who are over 6 feet tall and prefer to run when on a treadmill. The C700 track is single-ply running over small rollers. It’s not the best in terms of built and it would likely need replacement in a year or two especially if the treadmill is frequently used. 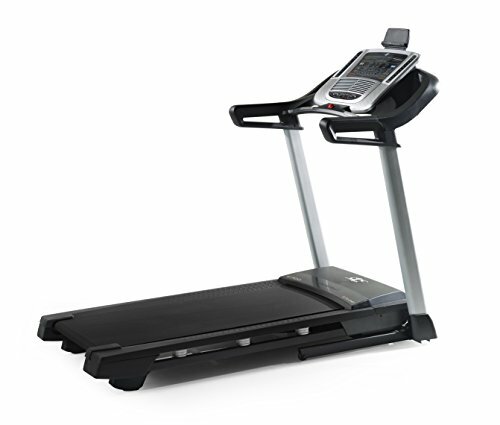 On the other hand, the NordicTrack C800 has a running area of 20 inches by 60 inches. Similar to the C700, it offers enough space for walkers and runners. But because the tread belt is longer at 60 inches, the C800 is better suited for taller people who prefer to sprint whenever they are on a treadmill. The NordicTrack C700 has a very basic console, which is something you can expect from an entry-level model. It gives basic work out details such as time elapsed, average time and distance covered. It has a simple layout, sans running track display or scrolling message boards found in other treadmills. The console doesn’t have that many features, too, to keep you busy. Of course, one can argue that the simple layout and lack of feature make the console more user-friendly. Users who can easily get intimidated or confused by cluttered consoles will appreciate how the functions are well laid out on the C700 console. The console lacks backlighting as well, which is something you would expect from an entry-level model. As such, some users say they find it difficult to read the info displayed on the console. Still, it is through the console that you can choose from the 20 integrated workout programs. These programs are all designed by professional trainers, giving you more challenges to your exercises. The console also comes with a tablet holder located above the console which can hold a tablet at the eye level. It’s a nice feature that allows exercisers to watch their favorite shows, movies or simply surf the net as they work out. It also allows the tablet to integrate with iFit Live that shows very immersive road workouts, giving the user the impression that he or she is really running on the streets. The iFit also features HD video workouts and virtual races. You’ll have to shell out $9.99 monthly for the subscription fee. The main difference between the C800 and C700 consoles is that the former has a six-inch LED backlit display. It is thus easier to see the basic work out details shown on the console. One-touch controls are also integrated into the console for quick and convenient changes in speed and incline. Hence, you can easily switch from running 12 miles an hour to walking at 2 miles an hour with a simple push of a button. Similar to the C700, the C800 also has an iFit Live-compatible console. It enables users to connect to the Internet, track their workout progress and even download countless workout programs from celebrity trainers. It is also on the C800 console where you can choose from the 24 workout programs integrated on this machine. The C700 is backed by a 2.75 HP DurX motor. It’s not the most powerful motor in the world but remember that the C700 wasn’t built for athletes looking for highly intensive workout sessions. The motor is good enough for most home gym users. The NordicTrack C800 is also powered by a 2.75 CHP motor. It has more than enough power to support people who want to walk, run or sprint on it. Be forewarned, though that the motor can struggle a bit when the treadmill is set at high speed or when the incline is steep. The C800 can accommodate users who weigh up to 325 pounds. It also features the FlexSelect cushioning system of Nordictrack. It allows users to customize their workout experience by turning on or off the cushioning. When the cushion is turned off, the deck is noticeably more rigid to stimulate the experience of running outdoors. Users who want greater joint support may turn on the cushioning to minimize the impact on their knees. The C700 may only support users who weight up to 300 pounds but it also has the FlexSelect cushioning system. It’s pretty remarkable for an entry-level model to have such kind of feature. The C700 has a speed limit of 10 miles an hour. The C800 should appeal more to joggers and runners with its 12 miles an hour limit. You won’t get bored working out on the C700 as it features built-in speakers plus an mp3-compatible music port. Plus, the console has water bottle holders and a cooling fan that can help keep you cool while working out. Because the C700 is built with the casual home gym user in mind, it has been designed to be easy to assemble and store. It features the EasyLift technology of Nordictrack which makes it easier for people to lift and fold the machine for easy and hassle-free storage. The deck reclines easily thus there is no need for heavy lifting at all. 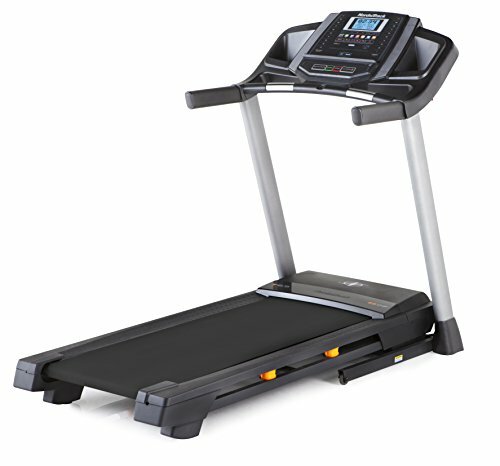 The C700 is also smaller than most treadmills with dimensions of 73 inches by 36 inches by 67.5 inches. Most home owners looking for a compact treadmill should find it a good choice as it won’t take up a lot of space at home. The C800 is also equipped with the same features found in the C700. It has the auto-breeze cooling fan that you can adjust automatically or manually. It also has the mp3-compatible music port, integrated speakers, tablet holder and one-touch adjustments. It also has the patented SpaceSaver design of Nordictrack as well as the EasyLift Assist. You can easily fold this machine without any help. And with its space-saving design, the C800 won’t be taking up a lot of real estate in your place, too. Both NordicTrack treadmills are equipped with heart monitoring features. In the C700 model, you can monitor your heart rate by holding on to the treadmill handlebars. The same feature is integrated into the C800, although you also have the option to use the wireless system. This makes the C800 more advanced in the heart monitoring function compared to the C700. While there are numerous similarities between the Nordictrack C700 and Nordictrack C800, you don’t need to be a rocket scientist to realize that the latter has more features that appeal to joggers, runners, and even regular gym goers. The NordicTrack C700 was designed and built with the casual home gym user in mind. Its incline level is limited to 10 percent while its speed limit is at 10 miles per hour. It has a standard 20 inch by 55-inch tread belt that may prove to be too short for joggers and runners. Yet because it is intended for casual users, the C700 is user-friendly. It comes with 20 workout programs designed to keep users interested and motivated. The console isn’t the most advanced but it’s good enough to show the important workout stats. And once you are done using it, you can easily fold the machine for easy storage. The C800 may have the same 2.75 HP motor used in the C700 but it has a longer tread belt. Its incline levels and speed limits are also slightly better than the C700. The integration of 24 workout programs further shows that the C800 is designed for advanced trainees. So which is the model more appropriate for you? If you’re the type of person who just wants a treadmill to walk or jog for 10 to 15 minutes, then the C700 is your bet. But if you want a treadmill that can challenge you, then you should get the Nordictrack C800.